This article is about the river in Southern Oregon. For the river in Polk County, Oregon, see Rogue River (South Yamhill River). For the city, see Rogue River, Oregon. The Rogue River (Tolowa: yan-shuu-chit’ taa-ghii~-li~’) in southwestern Oregon in the United States flows about 215 miles (346 km) in a generally westward direction from the Cascade Range to the Pacific Ocean. Known for its salmon runs, whitewater rafting, and rugged scenery, it was one of the original eight rivers named in the Wild and Scenic Rivers Act of 1968. Beginning near Crater Lake, which occupies the caldera left by the explosive volcanic eruption of Mount Mazama, the river flows through the geologically young High Cascades and the older Western Cascades, another volcanic province. Further west, the river passes through multiple exotic terranes of the more ancient Klamath Mountains. In the Kalmiopsis Wilderness section of the Rogue basin are some of the world's best examples of rocks that form the Earth's mantle. Near the mouth of the river, the only dinosaur fragments ever discovered in Oregon were found in the Otter Point Formation, along the coast of Curry County. 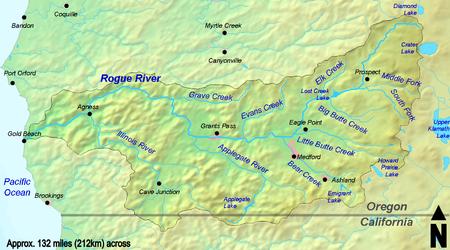 People have lived along the Rogue River and its tributaries for at least 8,500 years. European explorers made first contact with Native Americans (Indians) toward the end of the 18th century and began beaver trapping and other activities in the region. Clashes, sometimes deadly, occurred between the natives and the trappers and later between the natives and European-American miners and settlers. These struggles culminated with the Rogue River Wars of 1855–56 and removal of most of the natives to reservations outside the basin. After the war, settlers expanded into remote areas of the watershed and established small farms along the river between Grave Creek and the mouth of the Illinois River. They were relatively isolated from the outside world until 1895, when the Post Office Department added mail-boat service along the lower Rogue. As of 2010, the Rogue has one of the two remaining rural mail-boat routes in the United States.